From Route 128: Take Exit 24, Rte. 30, and head West on Rte. 30 for approximately 2 miles. Take a left at stoplight onto Wellesley Street. SEE ENTRANCES BELOW. From Rte. 2 area: Take Rte. 2 to 128 South. Take Exit 24, Rte. 30 and go west on 30 for approx. 2 miles. Take a left at stoplight onto Wellesley St.. SEE ENTRANCES BELOW. From Rte. 20: In Weston, turn south (left if coming from east, right if coming from west) at the School Street intersection. At the fork in the road, bear right onto Wellesley St. Pass Regis College. At next stoplight, cross Rte. 30. SEE ENTRANCES BELOW. From Boston via Mass Pike: Take the Weston interchange, Exit 15, and follow the signs for Weston, Rte. 30. At the top of the ramp, turn right. At first light, make left onto Rte. 30. At second stoplight, make left onto Wellesley Street. SEE ENTRANCES BELOW. From points west via Mass Pike: Take the Natick/Rte. 30 East interchange. Follow Rte. 30 East to the intersection of Rte. 30 and Wellesley Street (first stoplight in Weston). Turn right onto Wellesley St. SEE ENTRANCES BELOW. From the west via Route 30: Take Rte. 30 East to stoplight at intersection with Wellesley Street. Turn right onto Wellesley St. SEE ENTRANCES BELOW. Entrance to the HIGH SCHOOL playing fields/parking lot is the first left off Wellesley Street. HIGH SCHOOL gym is located in the main building behind the parking lot. Enter through first doors on left. 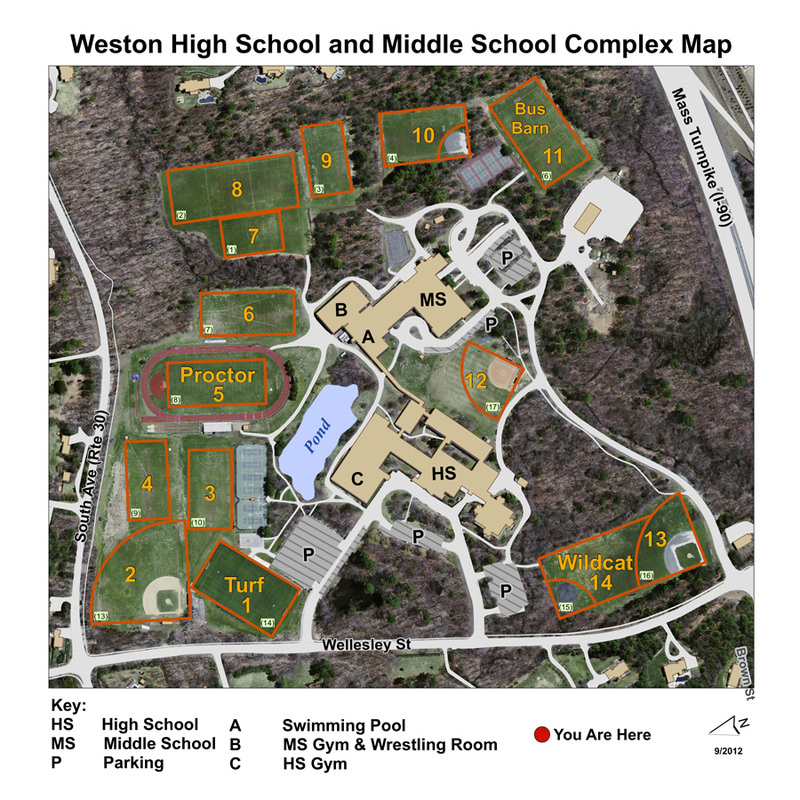 Entrance to HIGH SCHOOL is second right, marked by brown/white "Weston High School" sign. Continue past main building to main parking lot. HIGH SCHOOL gym is located in the main building. From main parking lot, follow sidewalk and enter through first doors on left.